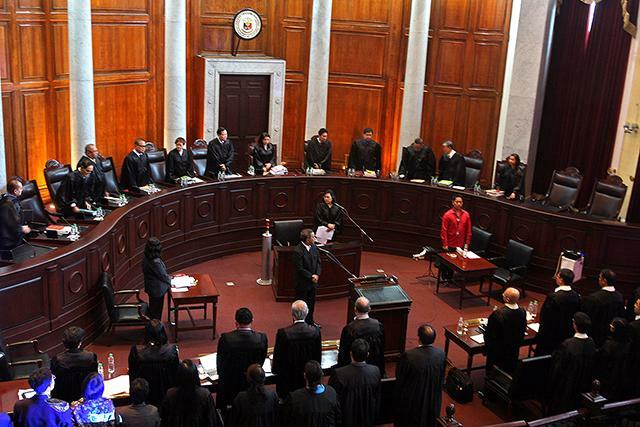 MANILA -- Eight out of 13 candidates vying for the position of Associate Justice of the Supreme Court (SC) are scheduled to be interviews by the Judicial and Bar Council (JBC) on September 26. The position was vacated by Associate Justice Samuel Martires, whose early retirement was granted by the High Court’s en banc, after he was appointed by President Rodrigo Duterte to replace Ombudsman Conchita Carpio-Morales, whose term ended on July 26. According to SC Clerk of Court and JBC Ex Officio Secretary Edgar Aricheta, the public interview would be conducted at the SC Main Building’s Division Hearing Room. The interviewees include Supreme Court (SC) court administrator Jose Midas Marquez and seven associate justices of the Court of Appeals (CA). “The public may submit a sworn complaint, report or opposition against any of the aforesaid candidates (a) by personal delivery or by mail to the JBC Second Floor, Centennial Building, SC, Padre Faura Street, Manila City; (b) by facsimile at telephone no. 02-552-96-07; or (c) by electronic mail to jbc@sc.judiciary.gov.ph and jbc87supremecourt@gmail.com not later than 4:30 p.m. of 24 September 2018 (Monday),” Aricheta said. From 9 a.m. until noon, the JBC has scheduled the public panel interview of Marquez, and CA Associate Justices Apolinario Bruselas Jr., Rosemari Carandang, and Stephen Cruz. While from 2 p.m. to 5 p.m., CA Associate Justices Edgardo Delos Santos, Japar Dimaampao, Ramon Paul Hernando, and Mario Lopez will face the JBC members. Aside from the eight SC associate justice applicants, the JBC said there were five other candidates for the said judicial position but their previous interviews are still considered valid. They are Oscar Badelles, Manuel Barrios, Ramon Garcia, Amy Lazaro-Javier, and Virginia Tejano-Ang. At present, there are only 13 justices in the 15-member High Court. Meanwhile, the JBC will accept applications and documentary requirements until Oct. 1 for those who want to apply for the Associate Justice post vacated by Chief Justice Teresita Leonardo-de Castro. Martires and de Castro's replacement would be President Rodrigo Duterte’s sixth and seventh appointee to the High Court, the others being Martires, Noel Tijam, Andres Reyes Jr., Alexander Gesmundo and Jose Reyes Jr.